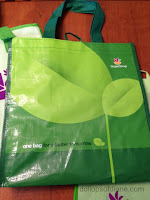 So I have reusable grocery bags – lots of them. They actually attack me each time I open the closet. My kids hoard their toys in them while playing various imaginary games around the house. My problem is that I often forget to bring the bags with me when I shop. I use them frequently for packing up/transporting other things but often actual groceries don’t end up in them. I know some people keep them in their car so that they’re always available and I think that’s a great idea. I simply just don’t have the space in my car to keep them. When I get the earth killing plastic bags, I at least re-use them to make myself feel better. They are most often used as liners for trash cans or bags for stinky diapers. 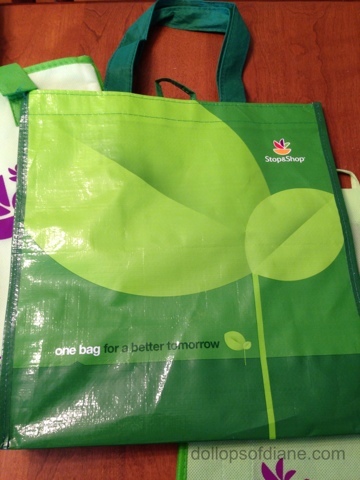 However, Stop and Shop’s new initiative is quite the motivator to make sure you’re using your reusable bags. From now through May 31, 20013, they will automatically enter any customer that shops with reusable bags (and uses their Stop & Shop card) into a drawing to win free groceries for a year. Yup – A YEAR! Can you even imagine how awesome that would be? It’s the kind of thing a stay at home mom dreams about! So make sure you’re bringing those bags (I’m talking to you, Diane) and using them for a chance to win. In the meantime, I’m giving away a $10 Stop and Shop gift card to one lucky Dollops reader for you to use however you like. If you don’t have a closet full of reusable bags, you might want to go pick some up or if you have enough bags you can use it to buy cookie dough ice cream (that’s what I’d do with it).